To date, this is the most popular article on this site, having held the top hits spot for the past several years now. My feeling is that it addresses the murkiness of the debate between overdrive vs. distortion. And despite many people like myself who constantly say they’re two, mutually exclusive things, it remains a subject that needs clarification. I’m glad this has been a -hopefully good – resource for people! Remember: Distortion Is What You Hear! Overdrive Produces It! I had an interesting conversation with a friend today regarding the difference between overdrive and distortion. Talk about two terms that are bandied about interchangeably in the guitar world! If you ask ten different guitarists the difference between them you’ll get ten different answers. But a common theme you’ll hear is what each sounds like; in other words, you’ll get a much more qualitative description as opposed to a quantitative description. What I’ve been after is a much more objective, quantitative description of each, but not necessarily too technical. So after talking about one versus the other, I decided to write down what we discussed, and throw my two-cents into the mix. First, let’s look at the two terms, but from the perspective of an amplifier. The simplest explanation I could come up with is that overdrive, or in audiophile terms, over-powering, occurs when input gain exceeds the capacity of a device to handle the amount of gain thrown at it; in our case, a tube. What happens is that the smooth waveform that goes into the device gets “clipped” because the device’s input capacity is less than what is being thrown at it. 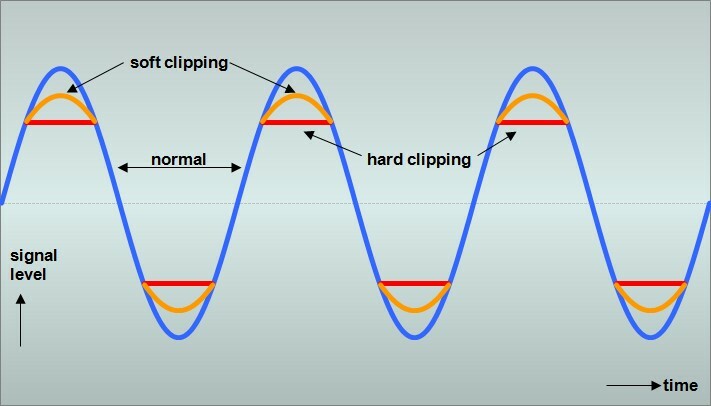 Sonically, we perceive the result of this clipping as distortion. The higher the amplitude of the wave, the greater amount of distortion we hear. But what about pedals? I’ll get to that in a bit, but I wanted to take the time to clarify these terms. There’s been a lot of confusion about these two terms because they’re used so loosely, and oftentimes interchangeably. For me, I’ll stick with the audiophile’s perspective of overdrive in that distortion is the result of overdrive or over-powering an amplification device. A way to think about overdrive vs. distortion is that overdrive happens in the front-end (what you put in), while distortion happens on the back-end (what you hear). Hmm… Cranked Amp? Booster? Overdrive? Distortion? But here’s where we get into a bit of murky territory, especially with pedals. Strictly speaking, if we’re talking about overdrive as simply overpowering the front-end of an amp to make the tubes clip, the only pedal that is technically an overdrive is a boost pedal that takes your guitar’s signal and ups its voltage. But lots of manufacturers call their pedals overdrive pedals. In reality, all of those are distortion pedals as they include an internal clipping circuit which is overdriven into distortion – this includes the venerable Tube Screamer. OMG! Sacrilege! So how do you tell the difference? That’s why I said we get into murky territory with respect to pedals. But as a rule of thumb, a distortion pedal will create a distorted sound irrespective of the amp. In other words, it’ll clip on its own. Put it front of the clean channel of an amp, switch it on, and it’ll create distortion. However, many, if not most, “distortion” pedals also provide a bit of gain boost to overdrive an amp. That’s where it gets murky, as most of the pedals termed “overdrive pedal” function as a combination of both overdrive AND distortion. Many people have asked me over the years if there is a sonic difference between overdrive and distortion pedals. Having tested several of these pedals over the years, I hate to sound ambiguous, but from a practical standpoint, in some cases, it’s simply too hard to tell. For instance, if I crank up my Timmy’s gain then add a bunch of volume to slam the front-end of my amp, I get a lot of crunchy distortion out of my speaker as the signal squares off. Moreover, I get a bit of compression and sustain and it “feels” like I’m playing through a distortion box. On the other hand, if I take my EWS Little Brute Drive and turn the gain knob to about 10 am, I get a similar sounding distortion with a similar feel – even though it’s a hard clipping device! They’re tonally a little different as the EWS adds a bit of low-end punch, but nevertheless, sonically and feel-wise, they’re extremely close. But there does exist a difference, and that is in output volume. When I do what I do with my Timmy to get that hard distortion sound, I have to use an attenuator because all the input gain creates A LOT of volume, so I attenuate the output so I can keep the volume at a manageable level. But with my EWS Little Brute Drive, because it’s a distortion pedal, it will clip irrespective of the amp, plus I set its output volume to unity. I can set my amp to any volume, then switch the pedal on to get my overdrive-like sound. I actually do this with the Little Brute Drive a lot when I don’t want to lug my attenuator to a gig. So yes, you can set up an overdrive or a distortion pedal to make it difficult to tell the difference, but in general terms, with a hard-clipping device, you’ll experience a lot more compression than with a soft-clipping device. The tone will feel “squishy” with very little dynamics. That’s not a bad thing, mind you, because sometimes that’s what you want. Overdrive pedals, on the other hand, because they don’t produce a square wave, will feel a lot more “open” and dynamic. There will be a bit of compression at higher gain levels, but rarely will you get to the order of compression that a distortion box will make. Unfortunately, this is yet another area where we get into murky territory, and where a lot of people confuse the two. So to start out, let’s just put it simply: Gain is input; volume is output. To provide a bit more clarity, think about the function of an amp as a two-stage device. The first stage takes the relatively weak signal from your instrument, then passes it on to the second stage and amplifies the signal to produce the sound. The first stage of an amp is called the preamp. The signal passed through the preamp is called Gain. The level of gain will have a direct effect on the volume of your amp. Typically, the more gain you introduce, the higher your volume. BUT, that said, higher and higher levels of gain will have a lesser and lesser effect on volume, as the pre-amp reaches its capacity to handle the amount of signal passed to it (commonly called saturation) and will max out sending all it can handle to the second stage or power amp. Think of the power amp as the stage that controls the output strength of your sound, or volume, if you will. It works similarly to the pre-amp in that the more signal you throw at it, the louder your volume. Some amps come with a Master Volume. Think of it as a valve mechanism that controls the amount of signal that is allowed to pass into the power amp. When it’s wide open, all the preamp signal will pass through to the power amp. For amps without a master volume, the amount of preamp signal allowed to pass to the power amp is set by the builder. So what does this have to do with pedals? If you look at the picture above, whether labeled or not, all come equipped with both a Gain (or Drive) and a Volume (or Level) knob. These work pretty much the same way as Gain and Master knobs on an amp. The Volume knob controls how much pedal signal will be sent to your amp’s preamp. That could be enough signal to saturate your preamp which will overdrive it into clipping and create distortion. Combined with a distorted sound from the pedal, this could – and in many cases does – create a very pleasing mix of distortion sounds. So which kind of pedal to choose? If you have a tube amp and just want distortion purely from overdriving the tubes, then a booster makes sense. There are several kinds of boosters. Some boost only a certain frequency range, like a Fat boost that boosts the lower frequencies. I personally prefer a clean, transparent boost that has a flat frequency response so that the distortion that occurs is my amp’s tone. I typically use a booster in conjunction with my amp set just at the edge of breakup, so when I switch it on, not only will I get a volume boost, I’ll overdrive the pre-amp tubes; and depending on how much gain I throw at the amp, I’ll get the power tubes working as well. Here’s a trick to try: If you have an effects loop, place the booster as the last pedal in your effects loop. When switched on, it will boost the gain going into your power tubes to saturate them. You don’t get a huge volume boost, especially if the power tubes are close to saturation, but you do get a bit of a kick. I learned that from Gene Baker, who does that in his rig. If you want to add a bit of color and overdrive your amp, then a soft-clipping pedal like a Tube Screamer works quite well. Tube Screamer-type pedals typically give you a mid-range boost that results in a much warmer and smoother distortion. Many also add sustain and a bit of compression to simulate power tube saturation at any volume. My Tone Freak Effects Abunai 2 is exceptional in this department. Then there are others, like the EHX Soul Food that add a bit color but interact well with the front-end of an amp. But that said, there are some like my beloved Timmy Overdrive that are transparent. They’ll give you the gain and boost but will not color your sound (Note: that you’ll still have to set up the pedal’s EQ). I will add though, that in general, an overdrive pedal sounds and performs best when the amp is already clipping a bit. The mixture of the two creates a more complex signal that is quite pleasing to the ears. If you want to get a distorted tone at any volume, then a distortion pedal is the way to go. There are lots of these on the market. My personal favorite (and the one I own) is the EWS Little Brute Drive. It’s a half-size pedal with a single knob, but it will give you TONS of distortion at any volume. I normally use it for leads, as it gives just a few dB of gain, but gives me all the distortion I need to get a great screaming tone! It also colors with a fat bottom end which makes leads sound beefy. Typically, you’ll use a distortion pedal against a clean amp. But then again, there are no hard and fast rules. Then if a distortion pedal still doesn’t provide enough gain for you and you need to get a hard-clipped, super-squishy, compressed distortion, then the fuzz will get you there. I call fuzz “ugly dog” distortion. To me it’s like an ugly dog that you look at and say, “holy s$%t,” but it has personality, so you can’t help but love it. Can’t say I’ve ever been into fuzz, but I’ve spoken to lots of players who use it all the time, and they love it! You can also chain overdrive and distortion effects to great success (aka “stacking”). I do this quite a bit because you get colors that you can’t get with just your amp. One thing that I do regularly is to use an overdrive pedal to push my amp hard, then when I want to get more tube compression and sustain, I slam the front-end with a booster (which is the last pedal in my chain). This doesn’t result in a volume boost because the tubes are already saturated, but you do get much more high-gain sound, and that can really work with solos. Again, there are no hard and fast rules. You have to play a lot of them to find your sweet spot. But that’s half the fun of it! I referred to my Timmy above as a “transparent” overdrive. There’s a lot of debate about transparency, but suffice it to say that while technically distortion is color, transparent overdrives are those that once their EQ is set up to match the EQ setting on your amp, they will not add any other “color” than distortion. On the other hand, once you set up a non-transparent pedal’s EQ, it will still add its own tonal characteristics to color your tone. In practical terms though, transparent overdrives fall more into the booster arena, but it’s the EQ and internal soft-clipping circuits that still define it as an overdrive. But further exacerbating the overdrive murkiness is that many overdrive pedals are actually purpose-built to mimic the sound of a specific overdriven amplifier. These are meant to be played through a clean channel with lots of headroom. A good example of this is the Caitlinbread Dirty Little Secret that produces classic Marshall Plexi to Super Lead tones. With a pedal like that, you just set your clean channel to purely clean and let the pedal do the overdrive work. Note: Several articles I’ve read on this topic use the generic “overdriven amp” explanation to describe all overdrive pedals. It would be okay if they described them with respect to how the pedal responds, but more often than not, they use the term to describe the sound. Unfortunately, they completely miss the pedals that are built to be transparent. I’m not saying they’re entirely wrong, but just a little narrow in scope when you consider the overall landscape of overdrive pedals available. Now… let’s add even more murkiness to the overdrive issue, shall we? There are some overdrives like the EHX Soul Food, which is a Klon Centaur clone, that at first blush, fall into the transparent overdrive category. So one would think that you’d set your amp at the edge of breakup, then use the pedal to push it over the edge and add its own clipping. This is a common way of using an overdrive, and it’s exactly how I use my Timmy. But even though the Soul Food wasn’t purpose-built to mimic a particular amp, I use it almost exclusively as a standalone soft-clipping device played through a clean channel. Its distortion sound is so damn sweet that I don’t want to taint it by adding clipping from my amp. So… what you choose will be wholly dependent upon what pleases you. I ended the article three years ago with the statement that you have to play a lot of pedals for find your sweet spot. Three years later, that statement remains true. You see, in a recent article where I asked if new overdrives are relevant with so many on the market, there are some pedals that work with certain rig configurations, and some that just do not. There are also some rig configurations that work great on stage that sound absolutely horrible in the studio. I’ve been in the studio for the last few weeks (grabbing studio time where I can), and when we worked on a song where I needed some high-gain sounds, my rig just did not work! I was using my trusty DV Mark Little 40 clean, with my Timmy and the Little Brute Drive for distortion. Sounded like crap when recorded. I ended up bringing in my VHT Special 6, cranking it up all the way, and slamming it with a booster! Worked like a charm, with all the high-gain character that I wanted out of that tone. So I learned a valuable lesson there.